Moving home is often the time to buy new electrical and home appliances. Apart from the essentials, like ovens and fridges, it can also be a great excuse to upgrade your home entertainment system or treat yourself to that fancy 4-slice, retro-style toaster you’ve had your eye on. 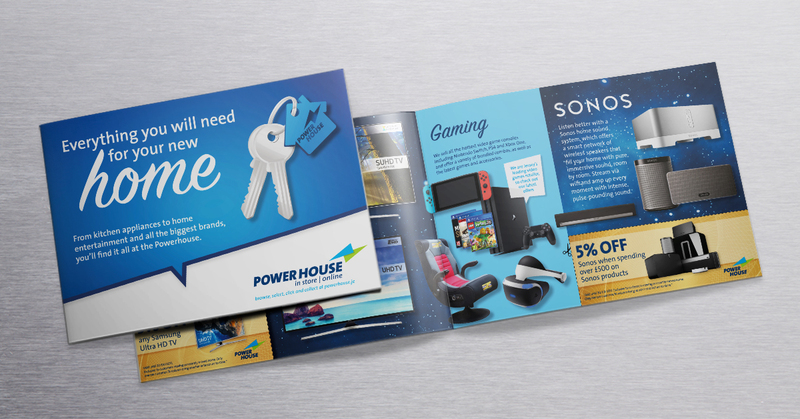 This is why Powerhouse, Jersey’s largest electrical retailer, asked us to design and print a booklet to target home-movers. They wanted a way to showcase products that not only might be useful, but products that are also aspirational. We created a 12-page, A5, full colour brochure displaying everything from home entertainment products to kitchenware and home security devices. The brochure used the new Powerhouse styling we developed earlier in year, which allowed for a more versatile and playful look, and included discount vouchers to encourage consumers to visit in store.